Perdicinae is a subfamily of birds in the pheasant family, Phasianidae, regrouping the partridges, Old World quails, and francolins. Although this subfamily was considered monophyletic and separated from the pheasants, tragopans, junglefowls, and peafowls (Phasianinae) till the early 1990s, molecular phylogenies have shown that these two subfamilies actually constitute only one lineage. For example, some partridges (Perdix genus) are more closely affiliated to pheasants, whereas Old World quails and partridges from the Alectoris genus are closer to junglefowls. Perdicinae is a non-migratory Old World group. These are medium-sized birds, and are native to Europe, Asia, Africa, and the Middle East. They are ground-nesting seed-eaters. 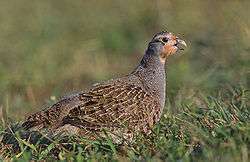 The subfamily includes the partridges, the snowcocks, the francolins, the spurfowl and the Old World quail. 1 2 Johnsgard, P. A. (1988). The Quails, Partridges, and Francolins of the World. Oxford, UK: Oxford University Press. ↑ Johnsgard, P. A. (1986). The Pheasants of the World. Oxford, UK: Oxford University Press. ↑ Kimball, R. T.; Braun, E. L.; Zwartjes, P. W.; Crowe, T. M.; Ligon, J. D. (1999). "A molecular phylogeny of the pheasants and partridges suggests that these lineages are not monophyletic". Molecular Phylogenetics and Evolution. 11 (1): 38–54. doi:10.1006/mpev.1998.0562. ↑ Kimball, Rebecca T.; Braun, Edward L. (2014). "Does more sequence data improve estimates of galliform phylogeny? Analyses of a rapid radiation using a complete data matrix". PeerJ: e361. doi:10.7717/peerj.361.